One of the most important actions that can help maintain the quality of any good or service is to collect relevant data consistently over time, plot it, and examine the plots carefully. 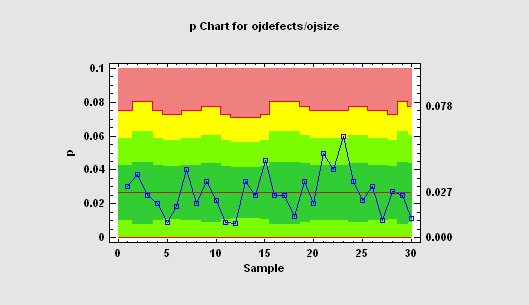 All statistical process control charts plot data (or a statistic calculated from data) versus time, with control limits designed to alert the analyst to events beyond normal sampling variability. Our STATGRAPHICS Centurion SPC software packages provide one of the most extensive collection of control charts available. All control charts can be used for Phase I studies, in which the data determine the location of the control limits, and Phase II studies, in which the data are compared against a pre-established standard. A special procedure is also provided to help design a control chart with acceptable power. E-mail alerts can be generated using our SPC software packages for when points fall outside the control limits or when a run rule is violated. The classical type of control chart, originally developed back in the 1930's, is constructed by collecting data periodically and plotting it versus time. If more than one data value is collected at the same time, statistics such as the mean, range, median, or standard deviation are plotted. Control limits are added to the plot to signal unusually large deviations from the centerline, and run rules are employed to detect other unusual patterns. 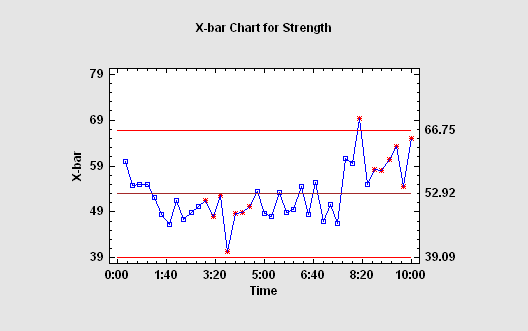 For attribute data, such as arise from PASS/FAIL testing, the charts used most often plot either rates or proportions. When the sample sizes vary, the control limits depend on the size of the samples. On most control charts, colored zones may be used to indicate the distance to 1, 2, and 3-sigma. When data are collected one sample at a time and plotted on an individuals chart, the control limits are usually quite wide, causing the chart to have poor power in detecting out-of-control situations. This can be remedied by plotting a weighted average of the data instead of just the most recent observation. The most common "tme-weighted" charts are the moving average (MA) chart and the exponentially weighted moving average (EWMA). The average run length of such charts is usually much less than that of a simple X chart. 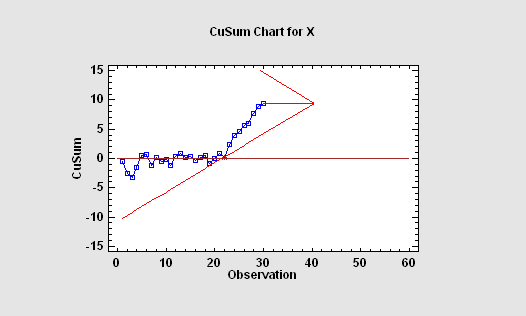 A useful chart for plotting measurements from a continuous process is the CUSUM chart, which plots at each time point the sum of all deviations from a target value up to and including the most recent observation. When the "V-mask" format for a Cusum chat is used, the process is deemed to be in control if all points on the chart fall within the mask. If any points fall outside the mask, as in the chart at the left, then an out-of-control alert is generated. When more than one variable are collected, separate control charts are frequently plotted for each variable. If the variables are correlated, this can lead to missed out-of-control signals. 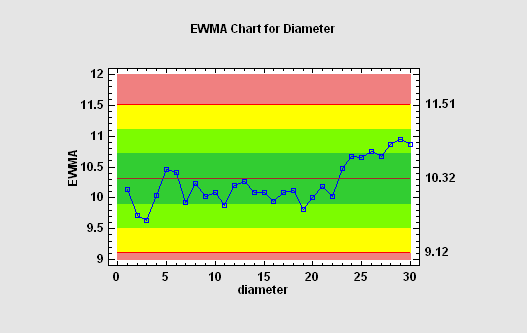 For such situations, STATGRAPHICS provides several types of multivariate control charts: T-Squared charts, Generalized Variance charts, and Multivariate EWMA charts. 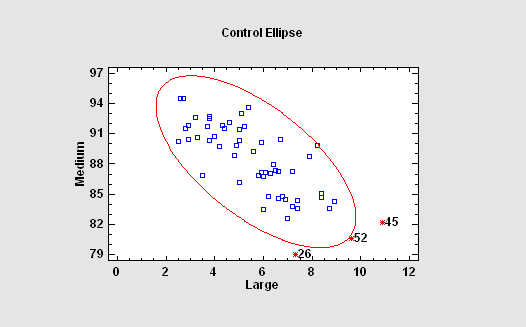 In the case of two variables, the points may be plotted on a control ellipse. With today's automated data collection systems, samples are frequently collected at closely spaced increments of time. Any sort of process dynamics introduces correlation into successive measurements, which causes havoc with standard control charts that assume independence between successive samples. 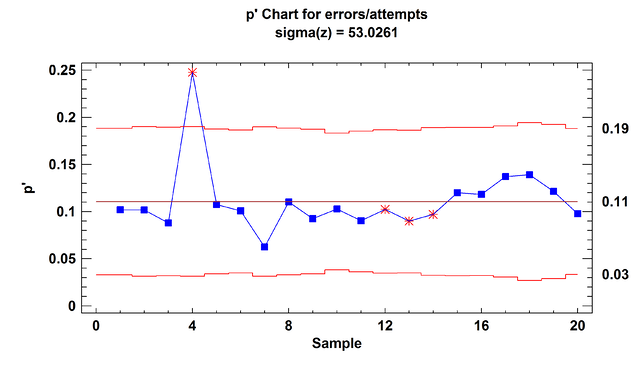 In such cases, a control chart that captures the dynamics of the process must be used to properly detect unusual events when they occur. 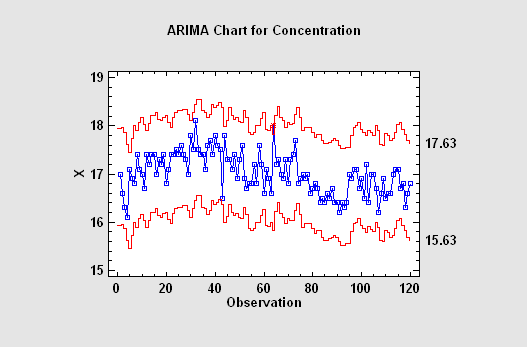 The proper chart for such situations is an ARIMA control chart, which is based upon a parametric time series model for process dynamics. Such charts either plot the residual shocks to the system at each time period, or they display varying control limits based upon predicted values one period ahead in time. 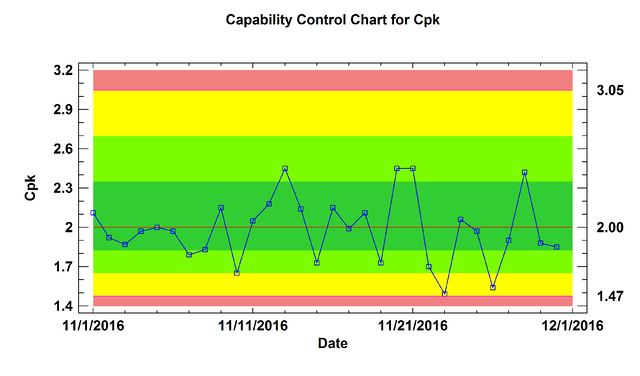 Control charts can also be used to monitor processes in which the mean measurement is expected to change over time. 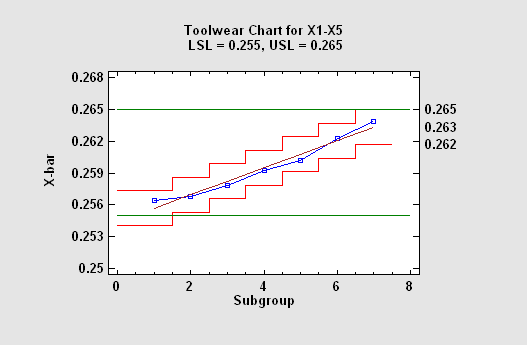 This commonly occurs when monitoring the wear on a tool, but also arises in other situations. 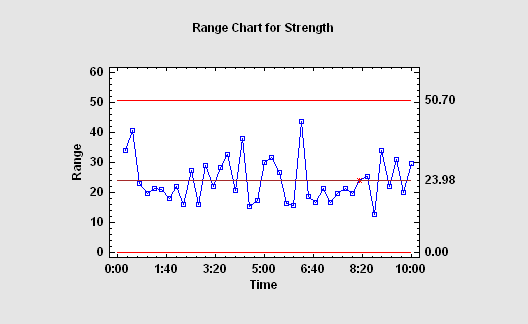 The control charts for such cases have a centerline and control limits that follow the expected trend. For processes with a high Cpk, requiring the measurements to remain within 3 sigma of the centerline may be unnecessarily restrictive. In such cases, the process may be allowed to drift, as long as it does not come too close to the specification limits. 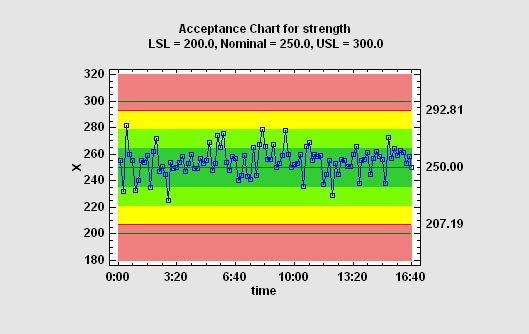 A useful type of control chart for this case is the Acceptance Control Chart, which positions the control limits based on the specification limits rather than the process mean. When monitoring a real-world process, the types of out-of-control situations that are likely to occur may be known ahead of time. For example, a pump that begins to fail may introduce an oscillation into the measurements at a specific frequency. 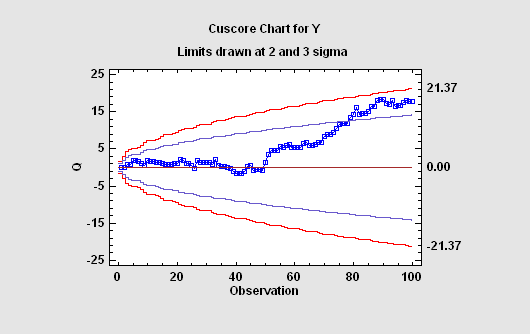 In such cases, specialized CuScore Charts may be constructed to watch for that specific type of failure. STATGRAPHICS will construct CuScore charts to detect: spikes, ramps, bumps of known duration, step changes, exponential increases, sine waves with known frequency and phase, or any custom type of pattern that the user wishes to specify. The P′ Chart and U' Chart procedures create control charts for attribute data without assuming that the data follow a binomial or Poisson distribution. Instead, the charts allow the mean proportion or rate to vary over the sampling period, a phenomenon known as overdispersion. The G Chart and T Chart procedures create control charts based on the intervals of time between the occurrence of rare events. Thet use the geometric and Weibull distributions to model the time between events. 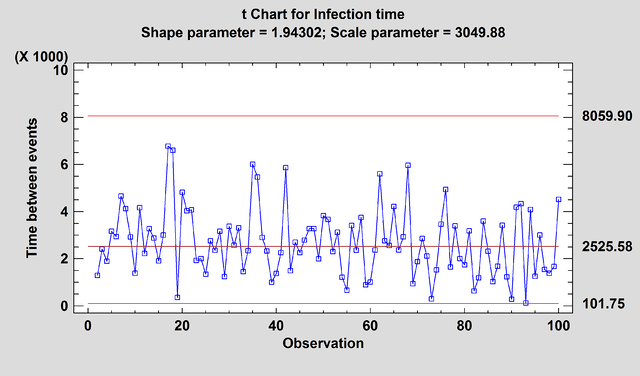 These types of chart are used frequently in the health sciences to monitor the occurrence of events such as post-surgical infections. For a control chart to be effective, it must be able to distinguish between situations in which the process is operating as expected and those in which it has deviated seriously from its target values. 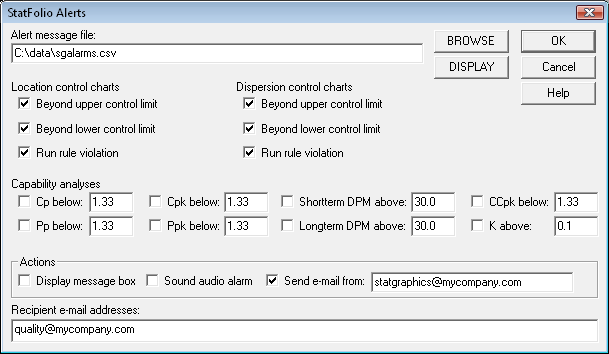 STATGRAPHICS provides a procedure for designing control charts that will detect deviations of a specified magnitude within an acceptable time. 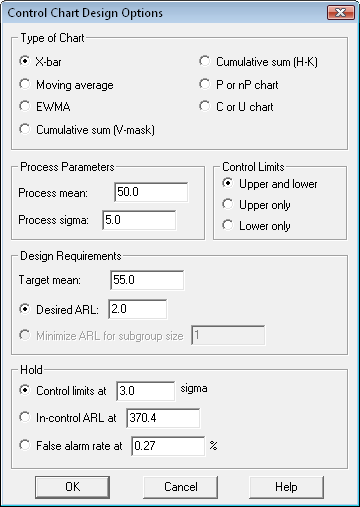 In a typical application, the user specifies a target mean and the desired average run length before a deviation of that magnitude is detected. The procedure then determines the number of samples and/or smoothing parameter that will achieve the desired performance. The control chart procedures can be automated using the dynamic updating capabilities of the software. In such cases, it can be useful to generate e-mail alerts whenever an unusual event occurs. Alerts may be created when points on the control charts fall outside the control limits, or when a run rule is violated. If specification limits exist for the variable being plotted, alerts may also be generated whenever estimated capability indices fall below a threshold value or when the estimated DPM is too large.